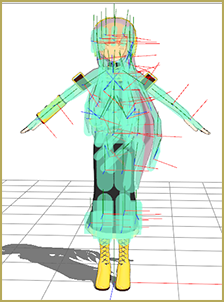 RAY-MMD: A method to get great results fast and easy! 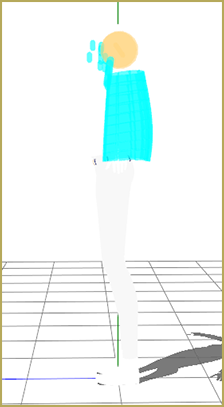 Why does my MMD model’s hair fall through the body? How do you stop hair falling through the the body? How do bodies stop bodies from clipping through hair? Recently, a reader sent an email with a simple problem: their model had hair falling through the body. They tried everything they knew how to do, but nothing fixed it. I responded with the canned answer of check for bodies, check for groups, then check for non-collision groups and it didn’t help. I might as well have been speaking Latin! This article seeks to explain in very simple terms why there is hair falling through the body. 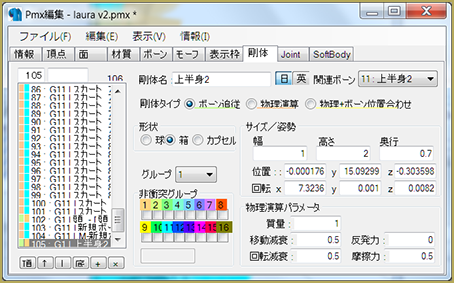 There are many illegally distributed versions of PMX Editor out there. I use likely the most illegal: EOSCustom’s translation. I will include screenshots of the Japanese version just in case anyone is using it. Step One: Are there bodies? 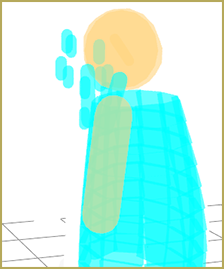 Bodies are those spheres, caps, and cubes that tell MMD that there is something there that should interact with. Adding them is rather easy, so don’t worry too much! 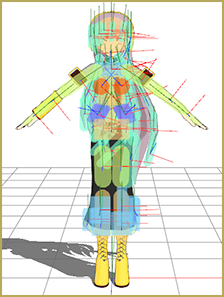 However, when you open a model in PMX Editor, you cannot see the bodies by default. The quickest way to enable body view is by pressing the “D” button. This will allow you to see and manipulate the bodies. However, I prefer pressing buttons to learning hot keys. In both instances, only bodies are selected. How can you tell if there are bodies that are missing? In the model the reader gave me, there were two sets of bodies. 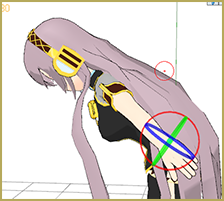 The hair physics and the head body. The hair had bodies, but the torso didn’t. That means that there will be hair falling through the body because there’s nothing to stop it! To add a body, select the bone you want the body to be attached to. To select a bone, ensure that “Bone” is selected in PMXE. Aside from clicking the button up at the top, you can also enable bone manipulation with the “B” key. 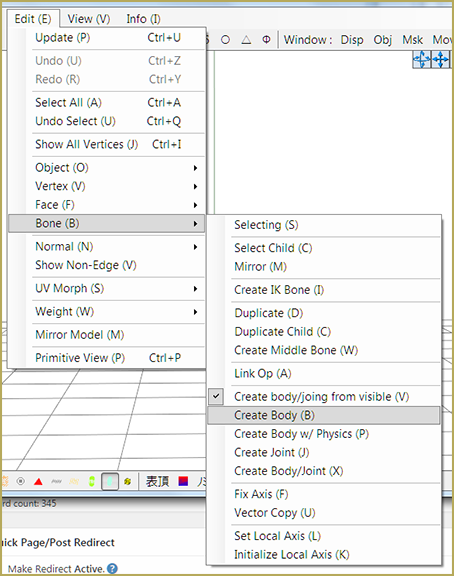 In EOSCustom’s version of PMXE, go to “Edit > Bone > Create Body (B)”. Below is the path to do the same thing in the Japanese version as well. Hooray! We have successfully created a new body for the hair to interact with! However, the body is not the correct size. I have no idea how to change the size of bodies without manually typing in the numbers. I’ve tried clicking everything on the handle, but nothing works. So, where it says “Size/Attitude” in the English version, just play with the height, width, and depth. The default is capsule, but you may find that box or sphere works better for you. You can change that under “Shape” in the English version. … you can see that it worked! Though her hair falls around her body, you can see the hair bodies on her back, kept from falling through! Note: If you do not add bodies to the arms, the hair will clip through the arms. However, arms weren’t part of the reader’s original question and the workflow is identical. Step Two: Are the Bodies the Same Color? So, your model has bodies for everything that should interact with each other. But the hair keeps falling through! What gives?! Well, let’s play with Luka to show off what I mean. I’ve edited her to demonstrate this, and I don’t think she’s happy. After my edits, in transform view I moved her around until I got her where I wanted…. with her hair falling through the body! 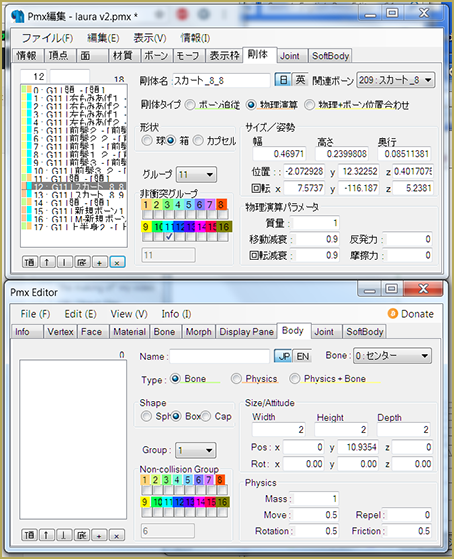 The first step in investigating what went wrong is to click on “Body View” or press the “D” key in the PmxView window as before. Oh no! All of the bodies are the same color! When this happens, you need to change the group. To change the group, click the drop down box next to “Group” while the bodies you want to change are selected. This will give you options for every group possible. Choose one for the body other than the group the hair is in. Most models use “1” for the body bodies. Changing the group is pretty easy. However, as multiple bodies will need to be changed, it’s a good time to learn some shortcuts to make it easier. 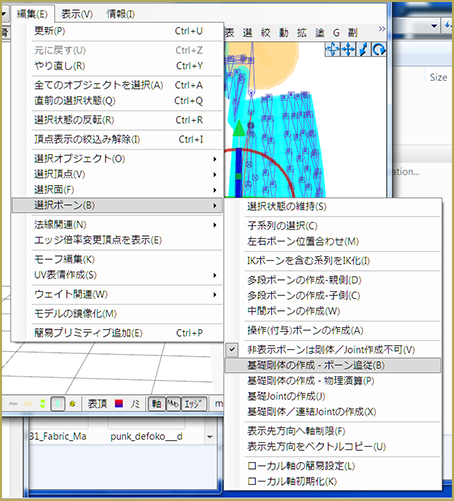 It’s always easiest to select bodies in the body pane and not in PmxView. The box with the scrollbar on the side is where you go to select the bodies. 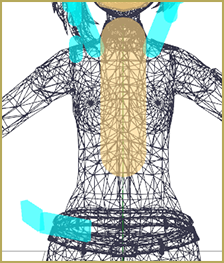 There are two ways to select multiple bodies at one time in the body pane. The first way is by using “Left Click + CTRL”. This will cause every body you click to be selected in addition to previously selected bodies. The second way is to use “Left Click + Shift”. This will select all bodies between the body you had selected before and the one you just selected. Step Three: Do the Bodies Look Correct? So, you open up a model you’ve been having problems with and it looks perfect. What gives?! Everything looks correct! The problem is the non-collision group. 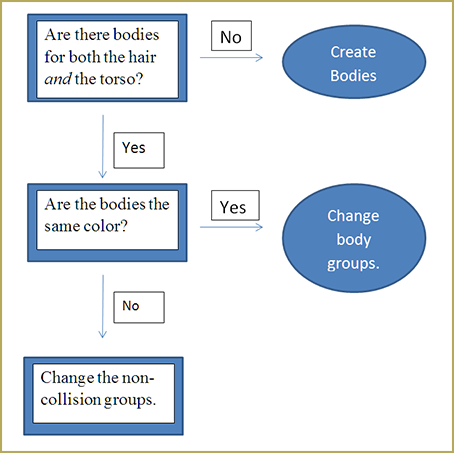 When you check a box in the non-collision group section, it means that any time a body collides with a body from the groups selected, it will pass through as if nothing happened. It’s almost as if the groups were in the same group! 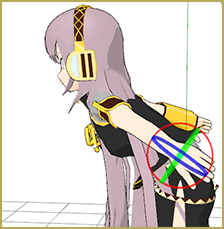 To make Luka’s hair pass through her body, I changed every body so that it was in a non-collision group with Group 1. Unchecking that box will make her go back to normal! 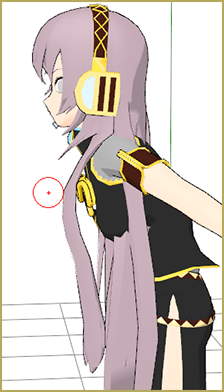 This one is the hardest for someone new to MMD to fix, I think. Learning to create bodies is difficult, and finding out what should belong to which group is annoying. However, you can instantly tell something is wrong in those cases. In cases like this, you need to check everything individually in the body pane! 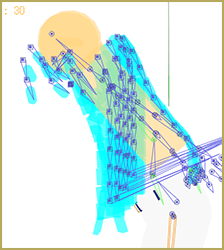 The easiest way to try to fix this is to select all bodies and remove “1” from every body’s collision group. However, this may mess up physics for other things than the hair. 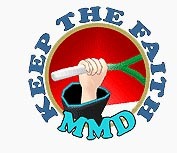 Sometimes MMD is just mean like that! If you have went through all of this and you’re still having problems, there’s a chance the issue is with broken physics or weighting issues. That stuff is really in-depth and complex compared to bodies. At that point, it’s probably better to just choose a different part! Thank you for reading, and I hope this was helpful! Convert SFM/GMOD Models Into MMD Flawlessly! Cycles Materials For Textures in Blender: Nice Textures for MMD Fast! Create Sph Files in Blender Without Drawing Anything! Nope! … Depending on what you want to do, you can use an art program to recolor a model’s texture images or you can use Blender and PMXE to create new textures. … See the tutorials. We offer no services like that. Um excuse me, are you sure you know what do you want? 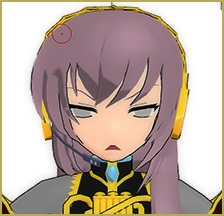 “Free online MMD skin editing” looks like you’ve came here led by the advice of some spam bot. Anyway, tutorials is what this site is about. Um excuse me, I am so naive… I should have recognized that term in parenthesis as a lead from a spam message. Thank you!